The actions of the Patriarchate of Constantinople (EP) in its process of granting a Tomos of autocephaly to the schismatic groups in Ukraine have created a canonical crisis. This point of “judgment” (the real meaning of “crisis”) is not so much about Ukraine, per se; but about the nature of the authority of the Ecumenical Patriarchate, and of primacy, indeed of episcopacy in the Orthodox Church. Thus, it affects every Orthodox Church and every Orthodox Christian. It has nothing to do with nationalism, though this has been a tool for manipulation of various parties involved; it has nothing to do with a rivalry between Moscow and Constantinople, though this is certainly exacerbated by the situation. It has nothing to do with Greeks versus Russians, or with Constantinople’s frustration with Moscow over the Cretan council. The roots of this crisis are a hundred years old, and its foundations date back to the Roman Empire. It is a time of judgment for Orthodoxy, to make us deal with reality as it is, and not how we imagine it to be, not how we would like it to be. This means that to resolve this crisis we have to look at the history of the past several hundred years, and the current situation, and make some decisions as to how we are going to proceed as the Church. This brings up many corollary questions: What is the relationship between the Church and the world, the Church and secular governments, the Church and the nation-state? How does the Church engage in missionary outreach, and the nature of those missions? How do the Local Churches relate to one another, maintain communion with one another and support one another, in relation to the secular world? The real issue is, what is the nature of the primacy of the Ecumenical Patriarch in Orthodoxy and how does it work in relation to the Synodal constitution of the Church? There are two systems of presuppositions which have clashed in Ukraine. First, the conciliar vision of the Church which sees Local autocephalous Churches as having full authority over their defined territories, and missions, with full jurisdiction over juridical, canonical and disciplinary matters residing in the Synod of that Local Church. The Patriarch of Constantinople has primacy of honor as the first among equals, on the basis of the ancient canons. However each Synod has its own primate, and each functions independently as autocephalous. The second system has a set of presuppositions which vest final authority in the Ecumenical Patriarch over all canonical decisions, with a right of appeal and the right to overrule the other patriarchs, primates and their Synods, and whose decisions cannot be appealed. The conciliar/synodal model has been the operating principle of most of the Orthodox Churches for the past several hundred years. The Constantinopolitan model has been developing over the last century, on the basis of interpretations of the ancient canons, and has most recently been applied in Ukraine. It relativizes the autocephalies of the national Churches, and asserts not only primacy of honor but primacy of jurisdiction over all the Orthodox Churches, and sole jurisdiction outside of their national territories. The specific conflict between these two visions of the Church manifested itself in Ukraine. While the interference of political powers and their financial ability to influence the leading actors, as well as the personal motivations of various actors involved, are important, they are side issues. The current conflict arose from the process of granting the Tomos of autocephaly to the schismatics in Ukraine, and especially, the validation of their schism. This was done despite the presence of the much larger canonical Ukrainian Orthodox Church, an autonomous Church under the Moscow Patriarchate. There was no consultation nor agreement with the UOC-MP, and they did not request autocephaly. The process involved the petition to the Ecumenical Patriarchate for autocephaly from the President of Ukraine, P. Poroshenko, on behalf of two groups that had long been in schism from the canonical Church in Ukraine. These bodies were led by former clerics who had been legitimately defrocked and anathematized by the Russian Orthodox Church, of which they had been members: the so called “Patriarch” Philaret Denisenko and “Metropolitan” Makary. The excommunication and expulsion of Denisenko had been universally recognized as just, for abuse of power and corruption, and for schism; and supported, even by Patriarch Bartholomew, who had also affirmed the complete competence and jurisdiction of the Russian Church to deal with these issues. Poroshenko’s petition included an appeal to overrule the decisions and disciplines levied against these clerics by the Russian Synod. The EP appointed two Exarchs, bishops from North America, to work out the details of the relationship with Constantinople and bring the two groups together. By entering Ukraine on official Church business without the blessing of the canonical Metropolitan of Kiev, Metropolitan Onuphry, the Exarchs of Constantinople violated the canonical territory of the autonomous Ukrainian Orthodox Church, and of the Patriarchate of Moscow of which it is part. Interfering in the Church affairs of another Local Church, and invading their territory are major canonical infractions. As a result, Moscow resolved to cease commemorating the Patriarch Bartholomew. Constantinople then withdrew the 300-year-old document, ceding jurisdiction of Kiev to Moscow. The biggest canonical infractions came, however, when the EP validated these schismatic groups and declared them fully canonical, took them under his jurisdiction, and validated the priesthood and episcopacy of their clergy. Moscow had no choice but to break communion with Constantinople at this point. Constantinople later established them with a Tomos of Autocephaly. In addition, the EP has established a stavropegial diocese, under himself, on the territory of Ukraine. He is operating on the basis of his own presuppositions; but they are not shared by the rest of the Church. Rather, he is seen as operating unilaterally, without consultation or conciliar consensus with the other Orthodox Churches. Perhaps the most significant act in this process has been the validation of the clergy of the schismatic groups, and the recognition of their organization as a legitimate church within the Patriarchate of Constantinople, albeit nominally autocephalous. None of the other actions of this process touch on the sacramental constitution of the Church; these, however, cut to the very nature of episcopacy and priesthood, and of the Church itself. Everything else, as offensive as it has been to the Ukrainian and Russian Orthodox Churches, is essentially administrative and juridical. Not that these are not important, but they do not have any implications for sacramental integrity of the Church or the continuity of the Tradition. If this schism was just administrative, the parties would eventually reconcile, even if grudgingly, as after Constantinople invaded and divided the Church in Estonia. There was a break in communion for a time, as there is now between Jerusalem and Antioch. But there was no issue that forced the rest of the Churches to take sides and go into schism with the others. The schismatic clergy all had cut themselves off from the canonical Church. Some had been canonically ordained, most were uncanonically ordained by schismatic bishops, and some had never been ordained as bishops. In an unprecedented sweep of the pen, the Patriarch of Constantinople declared all these clergy valid and canonical, lifting the defrockings and anathemas, and placing them under his omophorion—figuratively. Then the EP demands that they commemorate the new primate as the head of a legitimate Orthodox Church, and serve with him and his clergy, and does so himself. 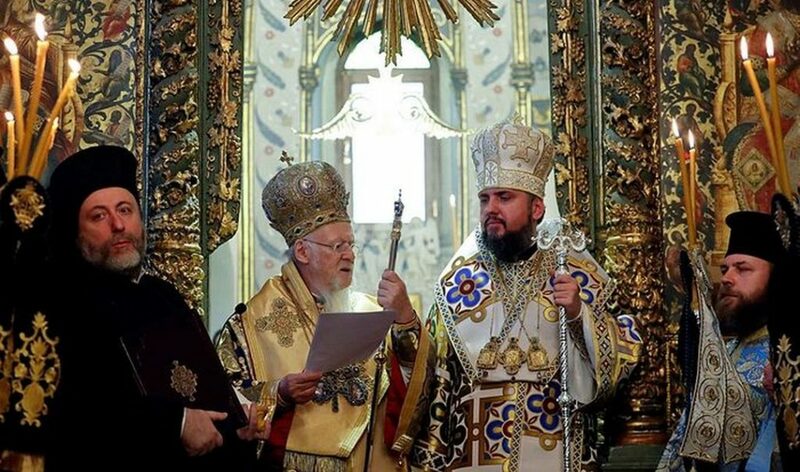 So all the Churches, the primates and Synods, must choose: Will they serve with clergy from this new Ukrainian Church under the Ecumenical Patriarchate? Those clergy and faithful will also go all over the world, to Jerusalem, Mt. Athos, Cyprus, Greece, Serbia, Romania. Will they be received to communion? Will they be allowed to serve? Will their Baptisms be recognized? To accept this new Ukrainian schismatic body under the EP implies that that Local Church accepts the presuppositions and assertions of the Patriarchate of Constantinople about its authority and jurisdiction. It has nothing to do with siding with Moscow against Constantinople. The assertions include: the right to receive appeals of bishops and metropolitans over the heads of their patriarchs, and to overrule them; that the Ecumenical Patriarch has full jurisdiction over all the Orthodox Churches, and is the final authority, arbiter and judge over all matters canonical, ecclesiastical and disciplinary; has the right to insert itself into the territory and life of every other Church. These mirror the assertions of the Roman Papacy, and its doctrines of universal jurisdiction. However, the assertion that the EP has the right, power and authority to validate uncanonical clergy, and those who had never been ordained, by simply declaring them valid, is something that the Pope would never dream of. This is something new and unheard of. The most precious legacy from the Lord Jesus Christ that the Orthodox Church holds and treasures is the Gift of the Holy Spirit, given to the Apostles on the day of Resurrection, and to the whole body on the day of Pentecost. By this gift, the Apostles became bishops and priests, and have handed over that charism to their successors by ordination, unbroken to this day. This charism of the Holy Spirit constitutes the Church, and is the foundation of its sacramental or mysteriological essence. It is this that preserves the continuity of Orthodoxy, it is the content of its very identity as the Church. The Eucharist may constitute the Church in time and space, but there is no Eucharist if there is no legitimately ordained priest or bishop. A bishop is ordained as a conciliar act, first with election by a Synod, and then the laying on of hands, consecration or ordination, by at least three bishops. This constitutes the affirmation of the whole Church. It is not possible for a bishop to be ordained by just one other bishop, but it can only be done as a synergistic act of the whole Church. There is no way that bishops or priests in canonical Churches can serve, commune or recognize the new Ukrainian organization under the EP. If you serve with a schismatic, you become a schismatic. It has nothing to do with “supporting Moscow.” It’s all about maintaining the canonical and sacramental integrity of the Orthodox Church. Even more difficult is the question of how one can recognize and serve with the Mother Church of a body with which you cannot be in communion. It doesn’t work. Thus, this entire issue has forced a schism on the body of the Orthodox Church. The Churches will have to choose sides, and wait for an ecumenical pan-Orthodox council to resolve it. But, it is the responsibility of the Patriarchate of Constantinople to call pan-Orthodox councils; and they are not interested. Thus there arises the essential issue of accountability. To whom is the Patriarch of Constantinople accountable? If he is first among equals, then he is accountable to the other primates, in a pan-Orthodox or ecumenical council. However, if as he asserts, he is the final authority and judge, and his judgments cannot be appealed, or to put it another way, first without equal, then he is accountable to no one, and has absolute authority; in short, he is just like the Pope of Rome. Constantinople has issued several other documents, Tomoi, of autocephaly over the past century: Poland, Albania, Czechia, besides Ukraine; and Serbia and others shortly before these. These texts assert the special rights of the Patriarch of Constantinople, that the new Local Churches must submit to the EP for major decisions on ecclesial, dogmatic or canonical matters. The EP sets itself up as the “highest juridical authority” in regards to appeals, and their decisions are not subject to revision. Thus it has authority over all the other Churches, which are required to submit to Constantinople. Thus the autocephalies of the various Churches, including Russian, Serbian, Bulgarian, Georgian, in addition to the above, are only relative. For example, the cancellation of the decree of 1686 ceding the Kievan Metropolitanate to Moscow, is perfectly legitimate in the system of the EP, as was the division of the Church in Estonia. Now the Serbian Church has to consider the future of the schismatic groups in Macedonia and Montenegro, and the Georgian Church the status of Abkhazia. All of these are schisms waiting for a resolution. Constantinople claims full authority over the so-called “diaspora,” including places where other Churches have long established canonical jurisdictional structures, especially North America and western Europe. On one hand, this is an attempt to bring order out of chaos. But the reality is that because of migration patterns, the various national Churches have set up churches in these areas to serve their people, who wish to be part of their home Churches, albeit in a foreign land. The new tomoi of autocephaly forbid the Local Churches from setting up parishes, much less dioceses, in the “diaspora”, as all those territories belong to Constantinople as “barbarian lands.” The fates of the American dioceses set up by Alexandria, Jerusalem and Ukraine, and the threats against the Georgian diocese in the US, are an example of what must be expected. All these external communities are ultimately transferred to Constantinople. The policy of Constantinople reduces the autocephaly of the Local Churches to a vague autonomy, without full authority either within or outside their national borders. This is not the conciliar/synodal understanding of what an autocephalous Church is, or how it operates.. There are two very different sets of interpretation of the canons. The EP bases their set of presuppositions on their own interpretation of the canons. This began in the 1920’s, when Meletios Metaxakis was Patriarch of Constantinople, and has expanded ever since. The other approach to the interpretation of the canons is in such books as the Rudder, by St. Nicodemos of the Holy Mountain, which strictly maintains the full independence and integrity of each Local autocephalous Church. The first hearkens back to the context of the Roman Empire, when Constantinople was the imperial capital, and was invested with a level of dignity and authority that came from being the Imperial Church. This authority was perhaps even strengthened in the centuries after the Ottoman conquest, when the Patriarchate of Constantinople was the head of the Ottoman millet, in which he headed the whole Orthodox community of the empire. At this time, the other patriarchates were suppressed and he had immense authority. The only major Orthodox country to escape this was Russia. It was for this reason that the Balkan countries and Georgia had to have their autocephalies recognized or renewed after their liberation from the Ottoman yoke. Constantinople itself has never escaped the Turkish Yoke. The other set of canonical interpretations, based in St. Nicodemos and the Rudder, have evolved in the new situation of the Churches in newly formed nation states. Despite the rise of Communism and the oppression of the Church by the Socialists, the Local Churches have jealously guarded their autocephaly, and operated as independent units. Orthodoxy became a body defined by conciliarity, or synodality. Each Synod has its own primate, differing from Church to Church in authority. The primacy of the Patriarch of Constantinople is largely symbolic, a primacy of honor and first among equals, but without any kind of universal jurisdictional authority. Each Church strives to maintain the integrity of the Tradition in a consensus of mutual accountability. Orthodoxy rejected the assertion of universal jurisdiction and authority by the Papacy. Today, the Patriarchate of Constantinople is raising the same issues that Hildebrandt did a thousand years ago, resulting in the schism with Rome. While these doctrines may not have been defined in a conciliar context, they have been played out in the Ukrainian schism, and in the documents of several Local autocephalous Churches; not to mention being put into print in synodal documents. This is a huge conflict of vision and ideology. One of the more interesting issues with Ukraine is the role of the Roman, and particularly, Ukrainian Greek Catholic Church. There is much that unites the schismatic group with the Uniates, especially a strong nationalist fervor and ideology. They also are pushing for a church that is in union both with Rome and Constantinople. There has already been widely published concelebration between the two groups. However, I think it is important to note that if we, as Orthodox, accept a papal ecclesiology, why are we going to accept it from Constantinople and not from Rome itself? This fiasco has brought Orthodoxy to crisis, a point of judgment. Do we submit to a universalist papal vision of the Church, with one final absolute authority that is ultimately accountable to no one? Or do we maintain the integrity of Orthodoxy as we have inherited it, a communion of autocephalous Churches whose unity is maintained by the Holy Spirit, in a spirit of mutual consensus and accountability? It all comes down to one decision: whether to serve with the members of the new Orthodox Church of Ukraine and its head, “Metropolitan” Epiphany, or not.